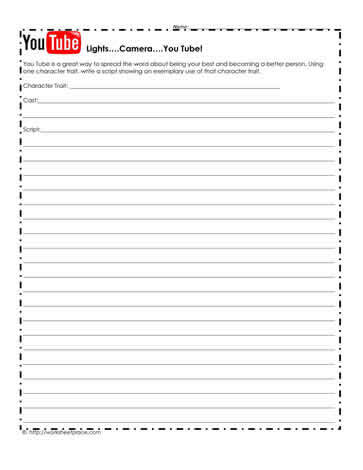 This worksheet requires students to determine the cast needed and the dialogue needed to teach or focus on a specific social skill. For instance, when working on respect a group of students would determine what it looks like and how it is shown. Then, a small skit is developed and recorded for You Tube. If students think their script will be shared, they are more apt to be engaged. Be sure to get parental permission if uploading the skits to You Tube. Otherwise, the skit should be performed in front of the class.